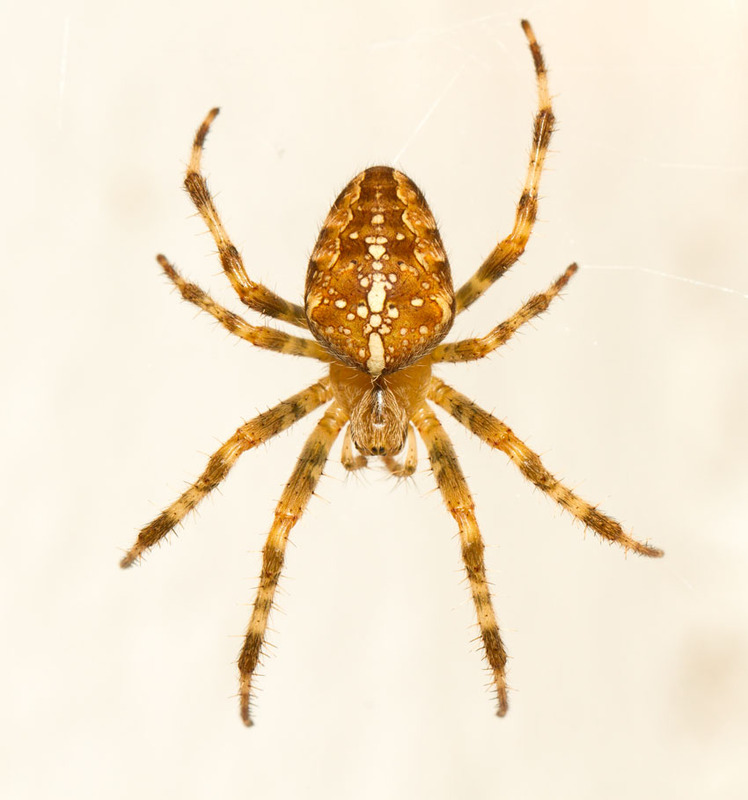 The common garden spider (Araneus diadematus) is one of the most familiar sights in our gardens as we move into autumn. These are the spiders that weave perfectly symmetrical webs, throw long guy-lines across paths, and sit patiently waiting for their prey. The large bulbous spiders are the females. 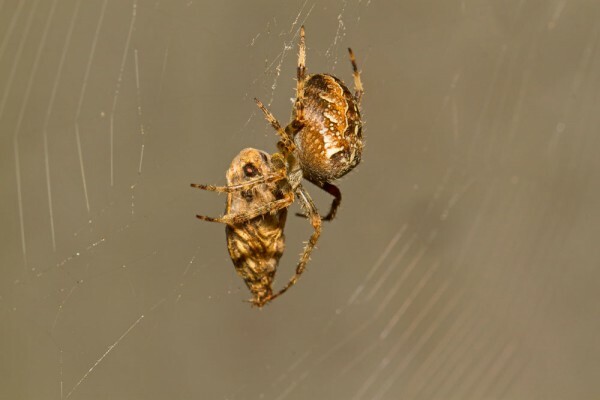 They catch their prey in the web, but that’s only the first part of the process. Before they can feed they need to immobilise the victim with a bite, and then encase it in webbing. This greedy female has captured a wasp (to the left) and what looks like a grasshopper, though it’s hard to identify in this state. It’s fascinating to watch a spider at work. The initial encounter is usually quite frought, especially if the prey is large or dangerous. The spider takes great care in its approach to avoiding flailing wings or stings. 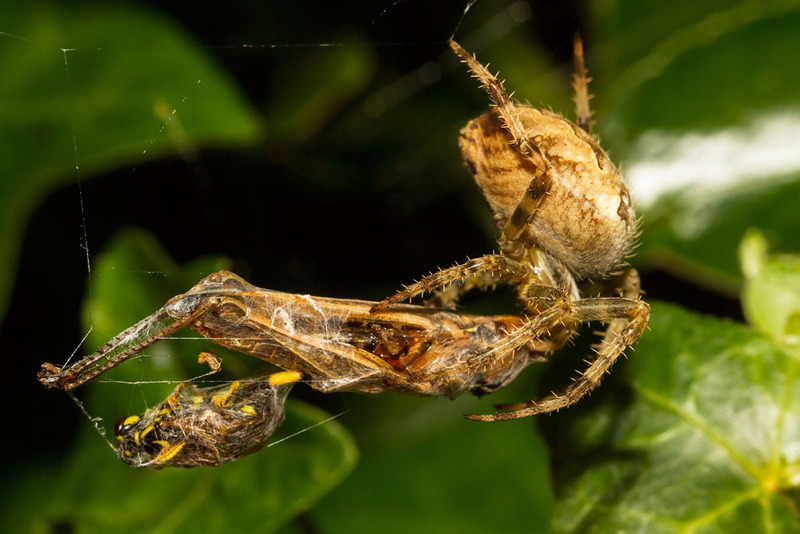 Once the prey is pacified, it gets to work quickly, wrapping the prey into a silky cocoon. It will often then leave the prey hanging, before going back later to feed. The final shot shows a spider with an encased moth which it had caught some hours earlier. Camera note: all shots taken with the Canon 7D and EF 100mm f/2.8L macro IS USM lens.